• Bring literature and leave extra copies behind. • Welcome those present with hugs or handshakes. • Be willing to stay after the meeting and talk with those present (with the help of an interpreter). • Bring writing pads and pens to aid communication. • Invite members and interpreters out to coffee, if school rules allow. Remember! We are guests! • Their rules must be respected. • Include this information in meeting schedules. • Advise Helpline(s), local newspapers, concerned agencies and schools, and clergy of meeting. • Confirm interpreter one week prior to meeting. • Have special seating reserved in front of the room. • Welcome newcomers with hugs or handshakes. • Speak slowly to allow for lip-reading. • Ask newcomers and interpreters out to coffee. • Ensure meeting budget can afford interpreter (approximately $50-$75) and include this in Prudent Reserve. • If transportation is a problem, have members of the meeting volunteer to pick up and drive new members home. • Arrange for an interpreter to be present well in advance. Confirm the date with him/her one week prior to event/convention. • Distribute flyers announcing the event/convention to local schools, agencies and social clubs for the deaf. • Arrange reserved seating in the front row. • Have all C.A. literature available. • Remember our 1st Tradition! • Public Information and Hospitals & Institutions Committees), and treatment centers in your area. 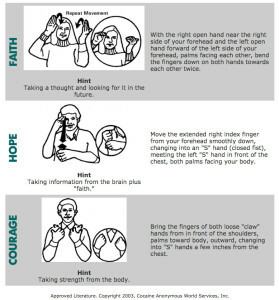 • Establish contact with local interpreters (via State Commission on Deaf and Hard of Hearing). Answer any questions they may have on recovery and C. A. Invite interpreters to open meetings (advise them of our anonymity statements). • Find out if your state has a telephone relay service (this is often a free service) to enable communication — computer modem, fax, TDY.